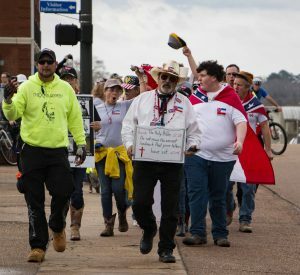 Neo-Confederate activists organized on the Square and marched onto the Ole Miss campus on Saturday to protest the removal of Confederate symbols from the area. Community members gathered along the path of the march to observe. Laura Antonow, director of the Office of College Programs at Ole Miss Outreach, said she thought the protest was as peaceful as anyone could have hoped for. “I think that it’s important for these groups to see that we don’t accept this kind of ideology in our community,” Antonow said. 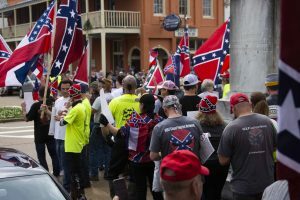 The two groups who planned the protest — Confederate 901 and the Hiwaymen — are neo-Confederate activist groups that stand against the removal of Confederate symbols in the community, specifically the two monuments that stand in the Square and in the Circle on the Ole Miss campus. Junior anthropology major Easton Wilson stood alongside police barricades on campus, watching both the protest and counterprotest, and he believes these protests will have a negative effect on the university. Dave Anderson is a tourist from Little Rock, Arkansas, who said he was just passing through Oxford and didn’t realize the protest was happening. While Anderson said he was disheartened by the protests, they are not negatively impacting his opinion of the Oxford community as a whole. Junior law studies major Bailey Easley sat in her parked car facing the Lafayette County courthouse as protesters from Confederate 901 and the Hiwaymen gathered around the Confederate monument. 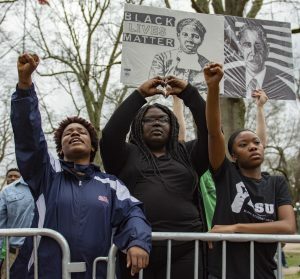 Senior exercise science major Bumeccia Barnes wore a shirt with the Huey P. Newton quote “Fight Back” and attended the counterprotest with her sister to stand against what they see as hate and express their refusal to be silenced or frightened by the pro-Confederate activists. Others had planned to be on the Square regardless, but chose to alter their schedule to be able to see the event. “I usually come here on Saturdays, but I figured it would be good to come down early before it started to see how many people would show up just out of curiosity,” sophomore public policy leadership major Sabine Horne said. The groups rallied on campus from approximately 2:30-3:30 p.m. The event ended without any violence or injuries, according to University Police Department Chief Ray Hawkins. Check out our full coverage of the weekend protests here.